I found a filing cabinet at Goodwill awhile back for just .99 cents, so of course I brought it home. Functionally, it was exactly what I needed. Aesthetically, not so much. Last week, it was finally time to give the cabinet #thefroscheffect. I removed the hardware before I took a before picture, but it basically looked like every single other metal filing cabinet you’ve ever seen--you get the idea. I washed scuff marks with a sponge and Pine-sol, but that was the only prep work I did. As I always do, I made my own chalk paint with BB Frösch Chalk Paint Powder. I had my local Home Depot paint guy mix a sample jar of Behr paint in Benjamin Moore’s “Pacific Grove Pink.” Most Home Depot paint counters have the color formulas for other paint brands, which makes it super convenient to get whatever color chalk paint I want! I also used a can of leftover Rustoleum Metallic gold spray paint. I also used four table legs I found at Home Depot for this project. They cost about $3 each. I marked and drilled holes on the underside of the cabinet so I could screw the legs in after everything was painted. After removing the hardware and drilling the holes, I painted one thin coat using cross-hatch strokes. Cross-hatch strokes help with the self-leveling properties of chalk paint so that the subsequent coat(s) will settle in for a nice, smooth finish. The first coat should be thin and won’t look like awesome coverage, but it is important when painting metal (or other less-porous surfaces) to simply get a thin coat of paint on and not overwork your brush. Overworking your brush or trying to paint too thick of a coat will lift your paint as you go. After I painted the first coat, it occurred to me that it would be easier to paint without the drawers in place, so I looked up a video on youtube. Turns out, removing filing cabinet drawers is embarrassingly simple! Just press up on the bar on the underside of the drawer as you pull the drawer out, and it will slide out easily! Even though chalk paint dries super quickly, when it comes to painting metal, it helps to give extra dry time so the paint can fully cure. So, while waiting for the paint to bond and cure, I painted the legs and hardware with a coat of chalk paint as well. This acts as a bonding coat for the spray paint that would otherwise easily peel off. Once the layer of paint on the legs and hardware was dry, I sprayed one coat of gold spray paint over everything. I did not seal the gold pieces with finishing wax because using a wax brush can dull the sheen. Instead, I applied two thin coats of Minwax polyacrylic. I painted the second coat after about an hour and decided to wait until the next morning to touch up any areas that needed a third coat. Waiting the extra day made a huge difference for the paint to bond! I gave a quick pass over the whole cabinet with 400 grit sandpaper to give it a nice, smooth finish. Then, I waxed with BB Frösch Premium Clear Premium Finishing Wax. 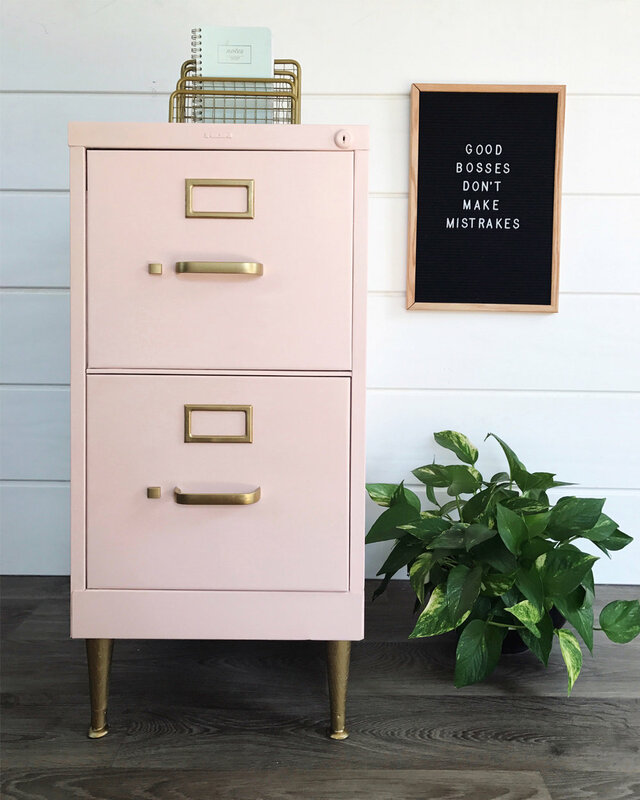 And, just like that, I have a super cute new filing cabinet to go with the sign in my office! If you are like me and prefer a video tutorial, hop over to youtube and watch the process here. 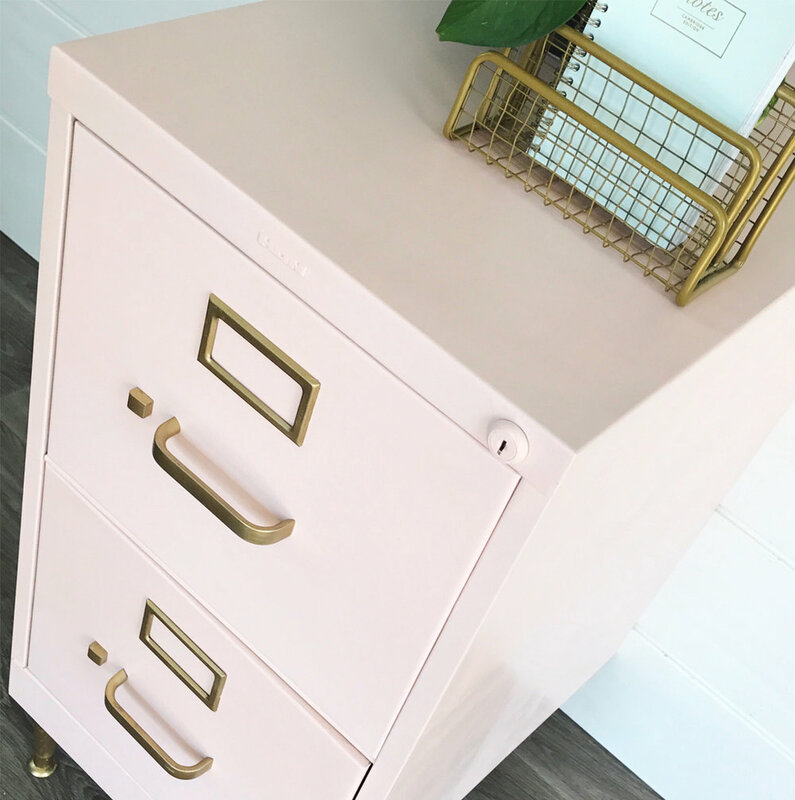 The whole project cost less than $20--filing cabinet and legs included! Definitely one of my quickest, most affordable and all-around favorite makeovers to-date!